Natural Bodybuilding FAQ: How to Choose a Good Personal Trainer? Personal training is becoming a hot profession these days. As a matter of fact, personal training is the fastest growing profession in the health and fitness industry! So it is a fair assumption that if you go to a gym, there will be at least one personal trainer offering his or her services to new bodybuilding and fitness enthusiasts. Now, if you are completely new to weight training and would feel more comfortable with hiring a trainer to guide you through the break in period of your bodybuilding journey, then you will be faced with the task of choosing the right trainer. It is crucial to make the right choice in this situation as the wrong person will end up giving you the wrong advice; advice that at best yields no results, which in turn gets you discouraged, and at worst gets you injured. If The Trainer Is Certified, Does That Means He/She Is Good? The fact that a trainer holds a certification is not a good indicator on whether the trainer is a good trainer or not. The reason for that is because most certifications are very easy to get and besides that, most use outdated information. If you don’t believe me then look around and you will find that many certifications can be achieved during a weekend seminar. What If The Trainer Has A College Degree And Looks Great? If the trainer has some sort of college degree that is somehow associated with the fitness realm, that only means that such trainer has some brains to him/her. Such a degree alone does not qualify the trainer as a good one either. Also, the fact that the trainer has the body that resembles the one that you have as a goal does not necessarily mean that the trainer knows what he/she is doing. Some people just have good genetics and whether they know what they are doing or not they end up looking good. So How Do You Determine Who Is A Good Trainer? The trainer really cares on whether the client achieves good results or not and thus gets to know the client’s personality, goals and limitations. From there, he/she should be able to create a program that would fit best the client’s needs. In order to do this, the trainer needs to create a guided discovery period of about six weeks where he/she finds out what exercises/foods the client enjoys the most, as well as slowly finding out what the goals of the client are. As we already know, when a person begins weight training, he/she may not necessarily know at that stage what their goals are. From the information gathered during this discovery period, the trainer then creates a personalized program that the client can stick with. As you can see, programs should not be generic “one size fits all” formulas. The trainer should also teach the client how to vary the program in order to avoid staleness. By the end of a 12 week period, a good trainer would have taught his client all that he/she needs to know in order to do bodybuilding on their own. The good trainer will always ask for your doctor’s clearance to start an exercise programand the trainer will not provide any services until such clearance is given. This is a great practice as it not only legally protects the trainer, but also it also protects the health of the client as this is the only way that the trainer can get good information as to the client’s health and possible limitations. For example, if a client is an insulin-dependent diabetic but neglects to inform the trainer about it, this could have serious implications later on. That is why it is better to get the information from the client’s doctor. Throughout the workout, the good trainer will pay more attention to the form of the client and proper breathing during the exercise instead of just being a glorified certified counter. I mean, anybody can count from 1 to 10, right?! Needless to say, the trainer’s only focus should be on the client and their form. The trainer always needs to be on time. It is completely unacceptable and disrespectful to the client if the trainer always shows up late. The trainer should have the type of personality that motivates the client and makes the client feel comfortable. Some trainers have an intimidating and bossy personality that makes it more like torture to train with them. The trainer constantly keeps up to date with the latest information. In addition, the trainer should be able to answer nutrition questions and supplementation questions. Last but not least, the trainer practices what he/she preaches and leads by example. So a good trainer is definately someone who is in shape. So remember, as usual, be analytical and don’t reach conclusions based on looks or the letters at the end of a person’s name alone. Such factors alone do not qualify the trainer as a good or bad one. Look beyond that and based on the additional data determine if the trainer that you are about to choose is the right one for you. Remember, it is your health and your wallet the ones that will suffer if you make the wrong type of decision. Can I Make Better Natural Bodybuilding Gains if I Train More? How Much Weight Should I Lift For Best Bodybuilding Gains? How Can I Lose Fat Under The Pecs and Increase The Bench Press? Can I Do A Second Session of Bodybuilding Training Using Aerobic Resistance Bands? I love your site. People looking to get in shape and those looking to get into bodybuilding would go far by becoming a member of your website and following your routines. You have all the information someone needs to lose weight and get toned and fit. The only ingredient they need to add it discipline. After that their ideal image should soon appear. Thanks for all the great information. 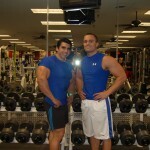 Leave a Comment with Facebook for Natural Bodybuilding FAQ: How to Choose a Good Personal Trainer?